Day & Night are among the latest of Lida Lavender’s contemporary Indian rug creations and they differ as much as day & night. The designs of the “Organic” line ultimately derive from Moroccan rugs. In particular, the two tone old ivory/ grey brown palette has obvious Moroccan tribal references. But the texture is much heavier, firmer and full-bodied, than the Moroccan originals. And the designs are much more rigorous. “Night” is just the opposite, with a dark hue, with brown over beige by about 2:1. The piles are longish, not shaggy, so high heels won’t catch. Plus these rugs cam be customized to size. 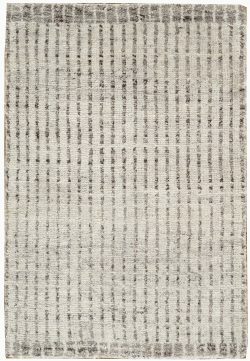 Are these Day & Night rugs minimalist? Yes, if you go by the design canons of traditional oriental carpets. No, if you count the number of subtly varying pattern elements. Each line, whether light or dark subtly varies, both internally and in comparison to its neighbors. There is plenty going on, but you just have to look. But we really don’t expect that actually you will get down and crawl about on the carpet, measuring stick in hand, comparing individual lines. Take Lida’s word for it. 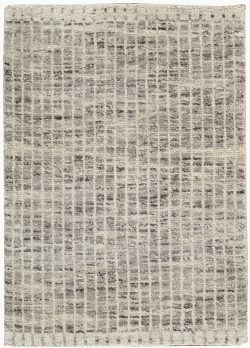 The pile yarn of the Day & Night rugs is in natural sheep tones and no dyeing or other chemical manipulation has intruded on the charming chance variations. 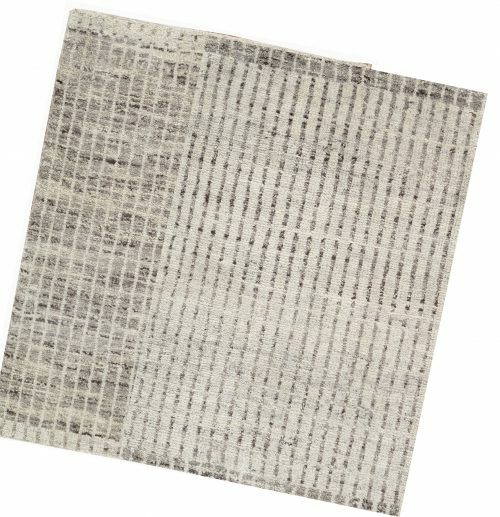 Many of the more interesting contemporary carpets originate in India. Pile carpet weaving in the subcontinent goes back to the end of the 16th century and one would expect, as in Iran, that there would be a heavy hand of tradition limiting design innovation. Nothing could be further from the truth. The Indian carpet factories will make anything, regardless of pattern, materials, color, size or texture. Everybody sources and manufactures in India. The “Made in India” corner label is everywhere as on these Day & Night rugs. Versatility is a key word here. Put the couch anywhere: parallel to the stripes, perpendicular to them, or at any angle. It all works. Keep it spare and the room looks bigger. Fill it up (don’t say clutter) and no important pattern areas are lost. The lines visually push outwards, on “Night” as much as on “Day”, so again the space is enlarged. Standard room sizes, 8’ by 10’, 9’ by 12’, 12’ by 15’, are always in stock (unless you get real crazy and take them all), and scatter size smaller rugs and unusual formats can be ordered. The firm texture and substantial weight means that the carpets will not skate about on the floor, but a quality non-slip pad is always recommended.